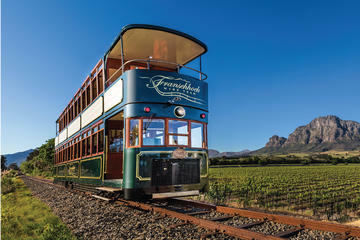 The Franschhoek Wine Tram hop-on hop-off tour is one of the best ways to discover the true essence of this picturesque valley, its rolling vineyards, breath-taking scenery, warm hospitality, world-class cuisine, fine wines and a 300-year history. 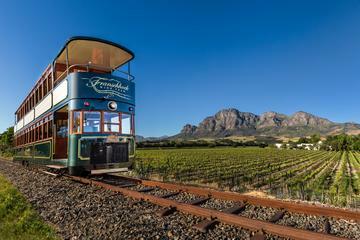 This wine tram in Franschhoek has become one of the most popular activities for wine lovers all over the world. 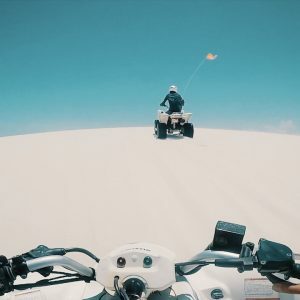 The quaint, small village of Franschhoek is the perfect place to move away from the busy city and to enjoy 8.5 hours touring around one of the most serene wine valleys in South Africa. With various lines to choose from, immerse yourself in an entire day of world-class wine tasting at a selection of over 22 award-winning vineyards. Be lead by an experienced guide who will elaborate on the history of Franschhoek, as well as the farms you will be visiting. If this is the ideal plan for you, read more about the tour lines, wine farms and prices available. Each line has individual departure times, and guests are asked to arrive 15 minutes prior to their departure. It is strongly suggested that you reserve a table for lunch at one of the farms along the route you have selected, a few days prior to the tour, as restaurants are likely to be busy. The Franschhoek Tram tour is known to be spot on with their time management; trams make stops at each wine farm every hour, so guests can choose to move on, or extend their visit and wait for the following tram. Each wine tasting will be at an additional cost depending on the farms pricing. Guests of the tram tour receive various discounts, which are discussed with you upon arrival. 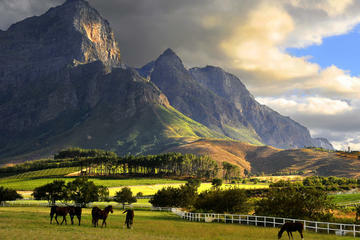 With that being said, wine tastings range from 4-8 tasters per vineyard and cost between R20-R50. A few farms also offer discounts on wine bottles to tram guests. The wine tour hosts 6 tram lines, taking guests to 8 wine farms per line. Dependant on how many stops you wish to make, guests are offered 3 departure times. Great trip and fantastic wine. Hard to go wrong! It was a fantastic day out – we got picked up at the hotel and had a marvellous driver who told us about the region as we were driven to the wine reagion. We made an additional stop at the jail where Nelson Mandella was held en route – an added extra. We then had a fantastci day tasting the wines goin on the trams and bus sampling various vintages as we went along. Excellent way to combine the usual wine tasting with something different and fun. I’d recommend the purple route if you want to spend more time on the tram. We had an excellent guide and so were able to personalize our trip to focus on things that interested us such as the galleries and buildings. Fantastic day out. Enjoyed local wine all day, saw multiple wine farms, was brilliant!